Rhine River boat s653luec-wsch, length 29,10 m, width 6,45 m, with departure in Oestrich-Winkel, Rudesheim, Assmannshausen, Bacharach, Kaub, Oberwesel, St. Goarshausen and Bad Salzig on the Rhine River. Approved up to 250 people. Up to 129 seats below deck. available boat cruises to Rhine in Flames in Koblenz. round cruise boat ticket(s) for adults and children from 15 years offer no. RIF0806luec from Winkel or Rudesheim or Assmannshausen or Kaub together with bus transfer and 2-course menu per person 119,20 EUR, from Bacharach or Oberwesel or St. Goarshausen or Bad Salzig or Boppard together with 2-course menu per person 105,80 EUR. There is a 19% added value tax included in the boat ticket price. Price change because of tax increase, diesel price increase, increase of the firework fee etc. possible until 4 months prior to the boat cruise date. If there is a price increase you have the right to cancel the boat tickets free of charge. Embarkation in Winkel in the Rhinegau (town part of Oestrich-Winkel in the Rhinegau, right Rhine river side, about 8 km east of Rudesheim) from 4:00 p.m., departure 4:30 p.m. Boat trip on the Rhine River from Winkel along Rudesheim with Bromserburg and Niederwald monument, Bingen with castle Klopp, Nahe river mouth and Mauseturm (mouse tower), ruin Ehrenfels, Assmannshausen, castle Rheinstein, Trechtingshausen with castle Reichenstein, castle Sooneck, Niederheimbach with castle Heimburg, Lorch with ruin Nollig, Lorchhausen, Rheindiebach with ruin Furstenberg, Bacharach with castle Stahleck, Kaub with castle Gutenfels and water castle Pfalz on the Rhine river, Oberwesel with castle Schonburg, Lorelei rock,. St. Goar with castle Rheinfels, St. Goarshausen with castle Katz (cat), Wellmich with castle Maus (mouse), Hirzenach, Bad Salzig, Kamp-Bornhofen with the "Feindlichen Brudern" ("Enemy brothers") castle Sterrenberg and castle Liebenstein, Boppard with Kurtrierische Burg (Trier elector's castle) to the Boppard Hamm. The passenger boat gathers together with the other passenger boats to the boat parade in the Boppard Hamm and drives together with these along the lights und fireworks Rhine in Flames / Rhine Aflame near Spay (left), Braubach below the castle Marksburg (right), Rhens (left), Lahnstein (right) to the big firework display near Koblenz / Coblence from the fortress Ehrenbreitstein. Seating place below deck on a passenger boat, sole entertainer with live music on board from 6:00 p.m. (restricted possibility to dance in the alleyway, width about 1,60 m). The firework displays can be seen from the open air deck or upper deck. Disembarkation in Kestert about 1:30 a.m., from there bus transfer to Winkel in the Rhinegau, return about 2:30 a.m. No disembarkation possible in Koblenz / Coblence. Boat tickets together with return bus transfer and dinner. Return with the car from Rudesheim in direction to Kaiserslautern. In the night, the ferry from Rudesheim to Bingen doesn't work. From Rudesheim you have to drive in direcion to Wiesbaden over the highway B 42 and freeway A 66 to the interchange Schiersteiner Brucke (Bridge), then you cross the Rhine River over the freeway A 643 to the interchange Mainz, over the freeway A 60 in southern direction to the interchange Mainz-Sud, and finally over the freeway A 63 in direction to Kaiserslautern. Departure in 65385 Rudesheim in the Rhinegau (right Rhine river side) 5:00 p.m. Boat trip on the Rhine River from Rudesheim with Bromserburg and Niederwald monument along Bingen with castle Klopp, Nahe river mouth and Mauseturm (mouse tower), ruin Ehrenfels, Assmannshausen, castle Rheinstein, Trechtingshausen with castle Reichenstein, castle Sooneck, Niederheimbach with castle Heimburg, Lorch with ruin Nollig, Lorchhausen, Rheindiebach with ruin Furstenberg, Bacharach with castle Stahleck, Kaub with castle Gutenfels and water castle Pfalz on the Rhine river, Oberwesel with castle Schonburg, Lorelei rock,. St. Goar with castle Rheinfels, St. Goarshausen with castle Katz (cat), Wellmich with castle Maus (mouse), Hirzenach, Bad Salzig, Kamp-Bornhofen with the "Feindlichen Brudern" ("Enemy brothers") castle Sterrenberg and castle Liebenstein, Boppard with Kurtrierische Burg (Trier elector's castle) to the Boppard Hamm. The passenger boat gathers together with the other passenger boats to the boat parade in the Boppard Hamm and drives together with these along the lights und fireworks Rhine in Flames / Rhine Aflame near Spay (left), Braubach below the castle Marksburg (right), Rhens (left), Lahnstein (right) to the big firework display near Koblenz / Coblence from the fortress Ehrenbreitstein. Seating place below deck on a passenger boat, sole entertainer with live music on board from 6:00 p.m. (restricted possibility to dance in the alleyway, width about 1,60 m). The firework displays can be seen from the open air deck or upper deck. Disembarkation in Kestert about 1:30 a.m., from there bus transfer to Rudesheim in the Rhinegau, return about 2:20 a.m. No disembarkation possible in Koblenz / Coblence. Boat tickets together with return bus transfer and dinner. Departure in Assmannshausen in the Rhinegau (right Rhine river side) 5:20 p.m. Boat trip on the Rhine River from Assmannshausen along castle Rheinstein, Trechtingshausen with castle Reichenstein, castle Sooneck, Niederheimbach with castle Heimburg, Lorch with ruin Nollig, Lorchhausen, Rheindiebach with ruin Furstenberg, Bacharach with castle Stahleck, Kaub with castle Gutenfels and water castle Pfalz on the Rhine river, Oberwesel with castle Schonburg, Lorelei rock,. St. Goar with castle Rheinfels, St. Goarshausen with castle Katz (cat), Wellmich with castle Maus (mouse), Hirzenach, Bad Salzig, Kamp-Bornhofen with the "Feindlichen Brudern" ("Enemy brothers") castle Sterrenberg and castle Liebenstein, Boppard with Kurtrierische Burg (Trier elector's castle) to the Boppard Hamm. The passenger boat gathers together with the other passenger boats to the boat parade in the Boppard Hamm and drives together with these along the lights und fireworks Rhine in Flames / Rhine Aflame near Spay (left), Braubach below the castle Marksburg (right), Rhens (left), Lahnstein (right) to the big firework display near Koblenz / Coblence from the fortress Ehrenbreitstein. Seating place below deck on a passenger boat, sole entertainer with live music on board from 6:00 p.m. (restricted possibility to dance in the alleyway, width about 1,60 m). The firework displays can be seen from the open air deck or upper deck. Disembarkation in Kestert about 1:30 a.m., from there bus transfer to Assmannshausen in the Rhinegau, return about 2:10 a.m. No disembarkation possible in Koblenz / Coblence. Boat tickets together with return bus transfer and dinner. Departure in Bacharach on the Rhine river (left Rhine river side) 5:45 p.m. Boat trip on the Rhine River from Bacharach with castle Stahleck along Kaub with castle Gutenfels and water castle Pfalz on the Rhine river, Oberwesel with castle Schonburg, Lorelei rock,. St. Goar with castle Rheinfels, St. Goarshausen with castle Katz (cat), Wellmich with castle Maus (mouse), Hirzenach, Bad Salzig, Kamp-Bornhofen with the "Feindlichen Brudern" ("Enemy brothers") castle Sterrenberg and castle Liebenstein, Boppard with Kurtrierische Burg (Trier elector's castle) to the Boppard Hamm. The passenger boat gathers together with the other passenger boats to the boat parade in the Boppard Hamm and drives together with these along the lights und fireworks Rhine in Flames / Rhine Aflame near Spay (left), Braubach below the castle Marksburg (right), Rhens (left), Lahnstein (right) to the big firework display near Koblenz / Coblence from the fortress Ehrenbreitstein. Seating place below deck on a passenger boat, sole entertainer with live music on board (restricted possibility to dance in the alleyway, width about 1,60 m). The firework displays can be seen from the open air deck or upper deck. Disembarkation in Bad Salzig about 1:20 a.m., Disembarkation in Boppard about 1:00 a.m. or Bad Salzig about 1:20 a.m., from there taxi transfer (surcharge) possible to Bacharach on the Rhine river, return about 1:50 a.m. If there is no minimum number of 20 people, you have to organize the return to Bacharach by yourself. No disembarkation possible in Koblenz / Coblence. Boat tickets together with dinner. Departure in Kaub on the Rhine river (right Rhine river side) 6:00 p.m. Boat trip on the Rhine River from Kaub with castle Gutenfels and water castle Pfalz on the Rhine river along Oberwesel with castle Schonburg, Lorelei rock to St. Goar with castle Rheinfels and St. Goarshausen with castle Katz (cat), Wellmich with castle Maus (mouse), Hirzenach, Kamp-Bornhofen with the "Feindlichen Brudern" ("Enemy brothers") castle Sterrenberg and castle Liebenstein, Bad Salzig, Boppard with Kurtrierische Burg (Trier elector's castle) to the Boppard Hamm. The passenger boat gathers together with the other passenger boats to the boat parade in the Boppard Hamm and drives together with these along the lights und fireworks Rhine in Flames / Rhine Aflame near Spay (left), Braubach below the castle Marksburg (right), Rhens (left), Lahnstein (right) to the big firework display near Koblenz / Coblence from the fortress Ehrenbreitstein. Seating place below deck on a passenger boat, sole entertainer with live music on board (restricted possibility to dance in the alleyway, width about 1,60 m). The firework displays can be seen from the open air deck or upper deck. Disembarkation in Kestert about 1:30 a.m., from there bus transfer to Kaub on the Rhine river, return about 1.50 a.m. No disembarkation possible in Koblenz / Coblence. Boat tickets together with return bus transfer and dinner. Departure in Oberwesel on the Rhine river (left Rhine river side) 6:20 p.m. Boat trip on the Rhine River from Oberwesel with castle Schonburg along Lorelei rock, St. Goar with castle Rheinfels, St. Goarshausen with castle Katz (cat), Wellmich with castle Maus (mouse), Hirzenach, Bad Salzig, Kamp-Bornhofen with the "Feindlichen Brudern" ("Enemy brothers") castle Sterrenberg and castle Liebenstein, Boppard with Kurtrierische Burg (Trier elector's castle) to the Boppard Hamm. The passenger boat gathers together with the other passenger boats to the boat parade in the Boppard Hamm and drives together with these along the lights und fireworks Rhine in Flames / Rhine Aflame near Spay (left), Braubach below the castle Marksburg (right), Rhens (left), Lahnstein (right) to the big firework display near Koblenz / Coblence from the fortress Ehrenbreitstein. Seating place below deck on a passenger boat, sole entertainer with live music on board (restricted possibility to dance in the alleyway, width about 1,60 m). The firework displays can be seen from the open air deck or upper deck. Disembarkation in Boppard about 1:00 a.m. or Bad Salzig about 1:20 a.m., from there taxi transfer (surcharge) possible to Oberwesel on the Rhine river, return about 1:45 a.m. If there is no minimum number of 20 people, you have to organize the return to Oberwesel by yourself. No disembarkation possible in Koblenz / Coblence. Boat tickets together with dinner. Departure in St. Goar on the Rhine river (left Rhine river side) 6:55 p.m. Boat trip on the Rhine River from St. Goar along St. Goarshausen with castle Katz (cat), Wellmich with castle Maus (mouse), Hirzenach, Bad Salzig, Kamp-Bornhofen with the "Feindlichen Brudern" ("Enemy brothers") castle Sterrenberg and castle Liebenstein, Boppard with Kurtrierische Burg (Trier elector's castle) to the Boppard Hamm. The passenger boat gathers together with the other passenger boats to the boat parade in the Boppard Hamm and drives together with these along the lights und fireworks Rhine in Flames / Rhine Aflame near Spay (left), Braubach below the castle Marksburg (right), Rhens (left), Lahnstein (right) to the big firework display near Koblenz / Coblence from the fortress Ehrenbreitstein. Seating place below deck on a passenger boat, sole entertainer with live music on board (restricted possibility to dance in the alleyway, width about 1,60 m). The firework displays can be seen from the open air deck or upper deck. Return in St. Goar about 1:50 a.m. No disembarkation possible in Koblenz / Coblence. Boat tickets together with dinner. Departure in St. Goarshausen on the Rhine river (right Rhine river side) 7:00 p.m. Boat trip on the Rhine River from St. Goarshausen with castle Katz (cat) along St. Goar with castle Rheinfels, Wellmich with castle Maus (mouse), Hirzenach, Kamp-Bornhofen with the "Feindlichen Brudern" ("Enemy brothers") castle Sterrenberg and castle Liebenstein, Bad Salzig, Boppard with Kurtrierische Burg (Trier elector's castle) to the Boppard Hamm. The passenger boat gathers together with the other passenger boats to the boat parade in the Boppard Hamm and drives together with these along the lights und fireworks Rhine in Flames / Rhine Aflame near Spay (left), Braubach below the castle Marksburg (right), Rhens (left), Lahnstein (right) to the big firework display near Koblenz / Coblence from the fortress Ehrenbreitstein. Seating place below deck on a passenger boat, sole entertainer with live music on board till stop in Kestert at about 1:30 a.m. (restricted possibility to dance in the alleyway, width about 1,60 m). The firework displays can be seen from the open air deck or upper deck. Return in St. Goarshausen on the Rhine river, about 1:55 a.m. No disembarkation possible in Koblenz / Coblence. Boat tickets together with dinner. Departure in Bad Salzig on the Rhine river (left Rhine river side) 7:30 p.m. Boat trip on the Rhine River from Bad Salzig, Kamp-Bornhofen with the "Feindlichen Brudern" ("Enemy brothers") castle Sterrenberg and castle Liebenstein, Boppard with Kurtrierische Burg (Trier elector's castle) to the Boppard Hamm. The passenger boat gathers together with the other passenger boats to the boat parade in the Boppard Hamm and drives together with these along the lights und fireworks Rhine in Flames / Rhine Aflame near Spay (left), Braubach below the castle Marksburg (right), Rhens (left), Lahnstein (right) to the big firework display near Koblenz / Coblence from the fortress Ehrenbreitstein. Seating place below deck on a passenger boat, sole entertainer with live music on board (restricted possibility to dance in the alleyway, width about 1,60 m). The firework displays can be seen from the open air deck or upper deck. Return in Bad Salzig on the Rhine river, about 1:20 a.m. No disembarkation possible in Koblenz / Coblence. Boat tickets together with dinner. Departure in Boppard on the Rhine river (left Rhine river side) 7:50 p.m. Boat trip on the Rhine River from Boppard to the Boppard Hamm. The passenger boat gathers together with the other passenger boats to the boat parade in the Boppard Hamm and drives together with these along the lights und fireworks Rhine in Flames / Rhine Aflame near Spay (left), Braubach below the castle Marksburg (right), Rhens (left), Lahnstein (right) to the big firework display near Koblenz / Coblence from the fortress Ehrenbreitstein. Seating place below deck on a passenger boat, sole entertainer with live music on board (restricted possibility to dance in the alleyway, width about 1,60 m). The firework displays can be seen from the open air deck or upper deck. Return in Boppard on the Rhine river, about 1:00 a.m. No disembarkation possible in Koblenz / Coblence. Boat tickets together with dinner. boat tickets for children from 10 to 14 years with own seating place offer no. RIF0806luec from Winkel or Rudesheim or Assmannshausen or Kaub together with bus transfer and dinner per child 119,20 EUR, from Bacharach or Oberwesel or St. Goarshausen or Bad Salzig or Boppard together with dinner per child 105,80 EUR. boat tickets for children until 9 years with own seating place offer no. 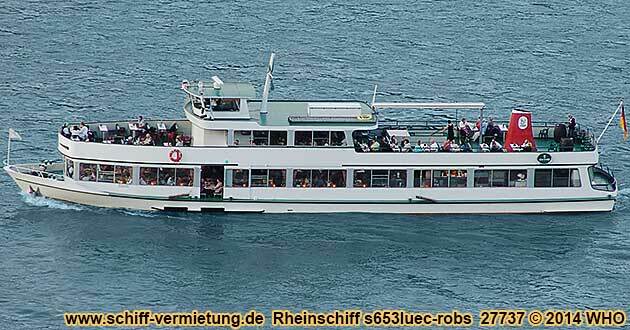 RIF0806luec from Winkel or Rudesheim or Assmannshausen or Kaub together with bus transfer and dinner per child 119,20 EUR, from Bacharach or Oberwesel or St. Goarshausen or Bad Salzig or Boppard together with dinner per child 105,80 EUR. Giving of the boat tickets only together with 2-course menu. Advanced meal order necessary. On this boat, you can only choose between the below mentioned meals. No other meals are offered during the firework events on this boat. The boat line doesn't accept ticket reservation(s) without selection of a meal. If you don't choose a meal, we assume that you wish the first meal "board platter" and will reserve "board platter" for you. The later change of the meal reservation by groups with less than 15 people is liable and is to be paid by the customer. The later change of the meal reservation by groups with 15 or more people is liable and only has to be paid by the customer after a bill has been issued.